This page is a collection of observations by our weeders, to alert each other to current developments on the weed front and exchange ideas. Click to log an observation. Contributions will usually be added to the page within a few hours, and definitely within a day. 07 Feb 2019 Bob Skeleton Weed All The Skeleton Weed has now set seeds so it is too late to address treatment this season. It is well on the way to forming a monoculture in the area just south of the pinnacle summit. 31 May 2018 Bob Skeleton Weed All Skeleton weed has been proliferating in the reserve for some years now but we have been too busy with higher priority weeds. There are now large areas inundated with it in the reserve to the point where we need to develop a plant to eradicate it. In autumn the died off plant with its strong stem pulls with its tap root and developing rosette and after rain pulls easily. However sheer quantities make individual pulling a long and meticulous task as the infestations we have are very dense. Skeleton weed is the classic example of a deep-rooted perennial, growing in summer by tapping water reserves deep in the soil. Its requirements for optimum growth are high summer temperatures, some summer rainfall, a distinct Autumn break with lower temperatures, deep, light-textured soil for taproot penetration, moderate calcium and phosphorous levels in the soil and minimum shading and competition from other plants. 21 Nov 2015 Len Tragopogon All We have at least two types of Tragopogon in the reserve Tragopogon porrifolius (Salsify) which has a purple flower and also the yellow flowered variety probably Tragopogon dubius.They look the same and it is only when it flowers that you will notice the difference. We have found that unlike the photo, our plants only have a single carrot like tapered root. (It maybe that like carrots they have multiple roots if the soil is fertilised) Consequently they are fairly easy to pull. If they are grubbed it produces multiple stems and more seed heads. We have also found from bitter experience that you need to remove flower heads see 2nd picture, 2nd row "close-up of flower bud (Photo: Trevor James)" or it will go to seed in less than a week At the moment the plants are about as tall as the wild oats they tend to be in. 03 Oct 2014 Bob Euphorbia Hawker The Euphorbia patches in the Hawker paddock near the PCS notice board are rampantly growing. There is too many to hand pull, so spraying would appear to be the only control option available to us. 21 Jun 2014 Bob Cape weed Cape Weed has now spread on the tracks mainly in the central north and south areas of the reserve. Its growth is currently vigorous making it susceptible to herbicide spray, but it is beyond grubbing control. 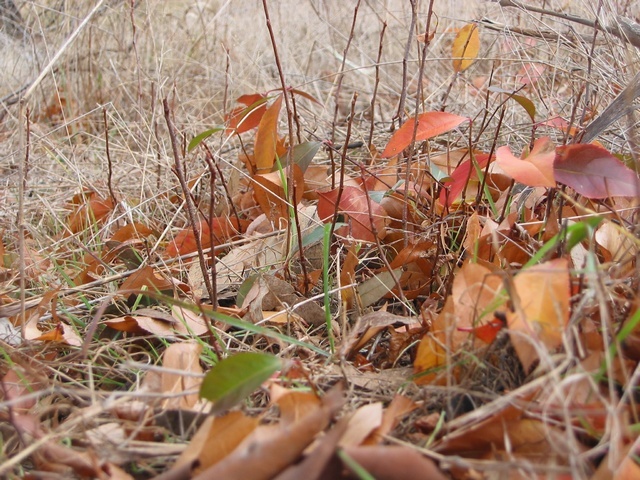 It may be opportune to target this weed over the quieter winter reason. 29 Nov 2013 Bob Saffron thistles Bottom Pinnacle I went on a walk today to appraise the situation with saffron thistles in the Bottom Pinnacle - they are now starting to flower. In the past three months the Thursday morning team has been poisoning grubbing and now scything the saffrons in the top Pinnacle, and I believe that team has the resources to deal with the new germinations resulting from the recent rain. However this has been at the expense of any resources of that team towards the saffrons in BP. So we now have the situation where there has been a significant increase in saffron numbers and density in BP and we have used our resourced to date on controlling the saffrons in TP. Consequently it will take a much larger effort than last season, to slash all the saffrons in BP before they set seed. I am not sure that the size of effort required is either doable or worth it when compared to the results of the trial winter transect spraying. Currently the transect area has an insignificant number of saffrons when compared with the surrounding infestations. In view of all this what should we be doing? 28 Nov Bob Saffron thistles Bottom Pinnacle The saffron thistles in Bottom Pinnacle are starting to flower. The infestation this season is very large and if we are to control this pest we need to start slashing on as large a scale as we can organise as soon as possible. 06 Apr Len Fleabane Central This morning we came across really dense patches of Fleabane. The plant spacing was at least 4 times as dense as the worst Saffron patches we have discovered in the past. There was also a lot of Fleabane seedlings amongst those in flower and seed. The patches were only small say 2 to 3 square metres. It does however indicate that if this Fleabane is left unchecked it could become a weed menace. 02 Apr Warren Saffron thistles Kama Large numbers of Saffron thistle rosettes are once more appearing on Kama ridge. They're also evident in many other places in the Reserve, but at nowhere near the density. 07 Feb, 2013 Bob Saffron thistles Bottom Pinnacle I am pleased to report that the saffron slashing with brush cutters and scythes on 8th Dec 2012 has proved highly successful at preventing new seed set. There has been almost no regrowth after the small amount of regrowth from the 8th Dec slashing was reslashed. 15 Dec Pax Verbascum North Kama Verbascum Alert! There is a forest of thapsus stalks to the east of the North Kama driveway, that need to be bagged. Near and south of the house, generally follow the ridge line/breakaway. There are also large numbers of grubbable thistles visible from the driveway, especially to the west. 15 Nov Bob Saffron thistles Bottom Pinnacle The main infestations are on the central tops of the paddock, with many extremely dense monoculture patches. These saffrons are now rapidly maturing, and we should see the first flowers in a week or two. Slashing when flowering has proved the most affective treatment to date. A couple of sessions with Brush Cutters will be needed if we are to attempt to control these infestations. St. John's Wort Bottom Pinnacle The St Johns Wart in Bottom Pinnacle are now mostly in full flower. It would appear that a lot missed out on last seasons spraying by the contractors, or the spraying was ineffective, as there are large carpets of SJW in the north east corner and south facing slopes of the Bottom Pinnacle. 13 Sep Bob Thistles Bottom Pinnacle About a month ago (August 12) the forested area immediately west and east of the steep gully that has been recently coir logged was grubbed of most thistles under the trees. There is now explosive growth of these thistles which needs spraying as there are way too much to grub. See map. 28 Jun Warren Paterson's curse Many small rosettes are present in places (too small to grub cleanly), as well as a few larger plants. We will need to be vigilant in spring. 31 Jan Pax Thistles, Verbascum Bottom Pinnacle, North Kama There are Verbascum ready for bagging in the NE tip of Bottom Pinnacle, the area across the creek, adjacent to the Tullys property. Also, many thistles suitable for lopping (but not necessarily bagging) as individuals and patches across North Kama South and Home paddocks. With long handled loppers would make for a very pleasant early morning saunter. Warren Thistles Dam A lot of advanced thistles needing lopping in the areas I sprayed for briars today (see map), particularly along the creek below the dam. 28 Jan Pax Verbascum Dam There are sprayable Verbascum rosettes in the rock dump and on the eastern side of the "new" fence. Horehound North Kama South Another 60L should finish spraying horehound in this paddock, with unsprayed areas remaining in (a) large patch at western corner and (b) mid-northern boundary. 14 Jan Pax Horehound, Paterson's curse North Kama South Another 200L of Agritone is likely required to complete treating the patch sprayed today. Many healthy plants (including seedlings) downslope from the rocky segment of this patch. Large associated area of Paterson's Curse rosettes ready for spraying. 11 Jan 2012 Pax Verbascum Southern There are fresh rosettes throughout this paddock and many stalking plants in not-so-recently sprayed areas. Well worth a comprehensive revisit. 02 Jan 2012 Pax Spear Thistles and Verbascum Kama, Hawker There are many Verbascum to lop throughout Kama paddock, suggest scything for efficiency. Also, many advanced, stalking thistles in Hawker paddock that need grubbing/scything ASAP. For a steer on where to look for these in Hawker please see my tracklog map from today. 29 Dec Pax Verbascum, Thistles, St John's Wort Southern I am satisfied there are very few, if any, stalking Verbascum remaining in this paddock, and that the great majority of rosettes have been sprayed. There are thistles to lop and spray, but most of the larger flowering individuals have been lopped. some wort remaining to be sprayed. 27 Dec Pax Verbascum, Thistles Eastern There are V. thapsus suitable for spraying in the NE corner, and very isolated Spear thistles throughout exotic grasses for lopping. 24 Dec Bob Prickly lettuce Weetangera Prickly lettuce is germinating in substantial quantities under trees and bushes, and needs to be addressed. 23 Dec Pax Verbascum, Thistles Dam' Weetangera While spraying St John's Wort in these paddocks I noticed some isolated small patches of Verbascum thapsus in Weetangera and rosettes and stalking Verbascum virgatum on the south facing slopes. Many grubbable, dispersed thistles in the same general area. There are mature seed pods of scotch thistles on the southern end of the ACTEW asphalt that need bagging (let me know if you do this). Generally the eastern side of Dam is free of Verbascum and thistles. 14 Dec Pax Verbascum, Thistles, St Johns Wort Dam I discovered significant areas of wort that were missed (now marked for later attention), and realised I should carry secateurs to cut stalking thistles at the base, or verbs below flowers/seed pods before spraying. This would result in a more complete treatment of the season's weeds, whilst marking briar for Warren to spray. The ground was damp enough to allow me to handpull many thapsus and virgatum. Some scotch rosettes at the dead tree. 09 Dec Pax Thistles Southern In the area where I sprayed today (see map) there are grubbable thistles throughout this sector of the paddock. 05 Dec Pax Various Central While mapping rabbit burrows today I noticed many stalking and flowering thistles amongst shrubs on the lower eastern slopes, and to the north of bunny central. Also scotch thistle flowering around the dead tree below the Pinnacle, and many virgatum flowering throughout. Only significant patch of wort is south of bunny central - but much smaller than what we've been tackling in Dam - otherwise dispersed to the east and south of the Pinnacle. Little or no wort to the west and north west. 02 Dec Pax Briars, Thistles Dam There are large numbers of briars below the dam, some of which may need cut/daubing (possibly too large to spray). There are also thistles stalking in the grass, with more closer to the creek. There are many small briars NE of the dam, closer to the creek, that are good for spraying. St Johns Wort Hawker Whilst burrow mapping today in Hawker I discovered many isolated stalking verbs and spear thistles (good for grubbing or slashing), with the latter mostly around dead timber/base of trees. Also noticed no verbs where I had previously sprayed, but the areas that I did not get to had many verb rosettes good for spraying now - essentially all of the paddock west of S1. Not many St John's Wort compared with other paddocks - 2 to 3 drums of chemical should be enough. Warren Briars Some briars have finished flowering and are setting seed. We need to be alert to the need to remove them as they mature if the plants are not sprayed out by then. 28 Nov Pax Various North Kama Northwest and North Kama South Noticed today many grubbable plants in these paddocks. Large stalking thistles and Verbascum that remind me of the good old days at the Pinnacle. If you are looking for the traditional grubbing experience, on virgin ground, this is for you. Would be an efficient use of one's time - with many ideal grubbing targets with little walking involved. Also lots of scotch thistle and horehound to spray. 27 Nov Pax Various Dam Despite spraying verbs and thistles, there are many of these species we missed here that require grubbing later in the season - let the verbs ripen! Not dense patches but isolated individuals around trees, below acacia thickets and along the creek (this deserves special attention ... some are tall and advanced). Many small briars marked. Would benefit from systematic treatment. SJW on the eastern side of creek needs a few more hours, the western side is unknown! 22 Nov Warren Saffron thistles Kama The worst patch of saffron thistle germination this year seems to be the one along Kama ridge (see map). This was the last patch we slashed (on 20th January 2011), so I suspect it was the only patch that we got to too late. An adjacent patch slashed on 13th Jan is showing very little germination this season. Timing may not be the only factor, of course. The patch where there is more germination also has less trees and therefore is probably a bit wetter, so that may be a contributor. 21 Nov Pax St Johns Wort Dam Many stalking verbs present and unsprayed, will need bagging. Also, many thistle rosettes suitable for spraying. 11 Nov Pax Verbascum, Thistles, Horehound Central There are many thistles suitable for grubbing on the eastern side of the Central Paddock (up from the track) and on the southern side of bunny valley. Also horehound seedlings that could be sprayed in bunny valley. Northern side of bunny valley should be inspected for verbs. 23 Oct Pax Thistles Kama Many (non-saffron) thistle rosettes in Kama suitable for spraying, or grubbing when stems show their presence. 13 Oct Bob Verbascum virgatum Southern It was noted that a patch of twiggy verbascum that had been slashed while green last seas was pleasingly free of new growth. Saffrons It was noted that among the standing dead saffrons in the Bottom Pinnacle new growth is prolific and bolting. This contrasts to most of the areas in the Pinnacle Nature Reserve that were slashed, where, with a few small exceptions, new growth is minimal. 11 Oct Warren Saffron thistles Kama Rosettes from 6th Oct already starting to stalk (up to 300 mm). Spraying is time consuming and "hit and miss". Recommend allowing to stalk and then slashing, but it will be interesting to see the results of the sprayed patches. 07 Oct Rosemary Verbascum virgatum Kama We repeatedly found that Twiggy verbascum with smallish rosettes were in fact sprouting from really hefty tap roots which had been mattocked-off previously. However it's also clear that careful, well-aimed digging with the point of a double-ended hoe may be the best way of levering/uprooting these taproots whilst causing minimal disturbance. 06 Oct Bob, Warren Saffron thistles Kama, Central Patches of dense rosettes are now being observed in Kama; spraying is suggested as an appropriate treatment at this stage. In Central, rosettes are still isolated and have been grubbed. 28 Aug Pax Horehound North Kama Home and Northwest Several horehound and thistle patches east of the driveway are to be finished, and there are large horehound patches to the west of the driveway to be commenced. African Lovegrass North Kama Home Bob scythed a patch of ALG down from the house, so that we could encourage ALG growth, and John F will return in 3-4 weeks to spray it. This is a significant incursion of ALG that we are keen to control. 14 Aug Pax Horehound Central, Hawker Still many plants to spray in Hawker, along the eastern side of Kama, and to the east of the Pinnacle. Saffron thistles Central No evidence of saffron seedlings/rosettes. 11 Aug Bob Spanish Heath Dam There are many small Spanish Heath seedlings growing in the long grass on the eastern side of Deep Creek (see map). These were first grubbed last season, but not before seed had been set. These spots need to be monitored. Warren St Johns Wort Dam, Kama, Southern Small numbers of St Johns Wort haves been evident right through the autumn and winter, but during the last couple of weeks it s starting to become more evident and is present, often hidden by long grass, just about everywhere where we have weeded. (non-Saffron) Central, Dam, Hawker, Southern There is clear evidence of effective prior spraying (dead or yellowing plants). The sector of southern paddock where I finished spraying on 10 July (see jpeg) has more plants to spray, and the area below the track in this paddock needs inspecting/spraying. There are large rosettes along Deep Creek that we need to grub. Verbascum Central, Southern I also suggest Verbascum grubbing along the eastern side of Central and Southern Paddocks - including many virgatum rosettes. 16 Jun Warren Verbascum Southern Very heavy infestation of V. thapsus south of the track. Also quite a lot of briars to remove. The east-facing slope north of the track (which was sprayed in March) had a quite a number thapsus to grub, but were nowhere near as thick as in the south where it hadn't been sprayed. 09 Jun Warren Woody weeds Weetangera A number of previously removed woody weeds (cotoneaster, laurel) have been revisited recently. In most cases the removal has been successful, but in many cases the area that was under the tree is thick with hundreds of seedlings from 50 mm to 300 mm in height. The photo shows such an example. Note that the field of view is about 40 cm. 19 May Warren Verbascum Southern V. thapsus rosettes appear to be wilting and dying in the dry conditions. Horehound Central, Dam, Hawker It's much easier to spray thistle seedlings and rosettes in acacia thickets than grub and bag later - this should be the priority for thistle control at this time. Same for around bunny central, where thistles may not be seen until after they set seed. Suggest checking the progress of thistle seedlings and rosettes to the north of the eastern BMX track - the herbicide may not be effective on advanced rosettes. A large proportion of the horehound patch at 4 ways is sprayed as well as a patch into the dell immediately below bunny central (see map). 29 Apr Rosemary, Nola, Wendy Verbascum and other broadleaf weeds Forest Following our efforts on 29 April (see recent weeding), we'd like to think we will get into a pattern of similar efforts. Our target areas are the gullies that run south, down to the track in the Stringybark forest. 26 Apr Lesley, John F, Pax African love grass North Kama This was a special foray into North Kama to treat a significant ALG infestation adjacent to the house. Most plants had dispersed seed, so only some was bagged. We will need to revisit this in the coming weeks, and be vigilant with this infestation over the coming years to beat it. Possibly the most significant ALG incursion into the Pinnacle/Kama area. Pax Thistles, Horehound Southern I intensively sprayed in the mapped area, and suggest grubbers avoid and that weeders please keep an eye on the weeds for a response of Nodding Thistles to Agritone. I'm not convinced about its effectiveness, so please inspect this area as you walk from the bottom of the Valley Track to 5 ways. Thanks! There are many large rosettes to grub elsewhere in this paddock, and I suggest a team also bag heads - though far fewer than previously still worth taking a bag. Warren General Hawker, Central I've just returned from spraying Verbascum, my first foray on The Pinnacle for 7 weeks, having been travelling. I was struck by several things. Most notably was how easy it is to see the weeds now, thanks not only to the saffron slashing but also the kangaroos trampling the long grass. The other thing I noticed straight away was how many young, flowering and not-yet flowering saffron thistles there still are - what an amazingly long season they've had this year! 09 Apr John F African love grass Forest I saw with great pleasure that someone had been spraying through the Dungowan flat area in the last 10 days or so - large numbers of dyed ALGs, now brown. Checking confirmed that this had been done by a PCS contractor. I'd rate the coverage 8/10, as spray was without deseeding so might be a bit too late, also there are many small plants not covered that will move to seed next season. Pax St Johns Wort, Thistles Kama, Hawker, Southern There are sprayable St Johns Wort at the bottom of Kama and in Southern east of the rock wall, and extensive nodding and scotch thistles thoughout all areas sprayed today (see map). 31 Mar Bob Nightshade Central There are very large amounts of seeding nightshade in the top western end of the Central paddock. Near the central track some had been pulled some days ago. 20 Mar Pax Verbascum Kama, Southern There are still verbascum and thistle heads worth bagging, especially in southern paddock. 3-4 more hours would have this job finished in Kama. The shorter, cooler, cloudier days may be slowing rosettes from stalking, buying us time to finish bagging in southern ... then we return to spraying rosettes and grubbing stalking plants. St Johns Wort, Horehound, Thistles Kama, Southern There are large areas of green SJW at the bottom of the Kama paddock, but no signs of flowers. Please keep an eye on the sprayed patch of horehound and thistles on the NW edge of the southern paddock to check that Agritone is affective on thistles at the prescribed rate. 17 Mar Bob Verbascum Southern Large area of dense verbascum thapsus requiring urgent spraying. See map. 14 Mar John B Nightshade Forest I've been noticing how different the vegetation is around fallen trees in the woodland of the Forest block compared with other parts of the reserve, where fallen trees seem to be a magnet for nightshade and thistles of every variety. In the woodland, they're surrounded by baby eucalypt saplings and new bursaria and cassinnia plants. An exception is around the fallen E. bridgesiana, just above the Dowling Track about 50 m SE of the steel gate, which that has attracted a lot of nightshade for some reason (but fortunately no thistles). I guess that just reflects how different the seedbank in the woodland is from the rest of the reserve. 06 Mar Pax Paterson's curse Southern Whilst inspecting for nodding thistles I noticed many small PC rosettes around five-ways. If anyone is interested it would be good to spray them with brushoff, as well as the other known patches of PC (two in Kama, along the Dowling Track, and one on the eastern slope of Southern Paddock, adjacent to the dump) as they will be up too. Might be best to spray while the rosettes are small. Pax Nodding thistles Central, Southern I believe bunny central requires a close inspection for noddings - and then Central Paddock is essentially cleared of nodding thistle (that is suitable for bagging). There are many rosettes to be sprayed including in the plantation at the bottom of Central. The priority for this activity is now Southern Paddock, there are NdTs in the NE segment near the track, and down adjacent to the Tully track. This specific task could be completed in the next week or so. Suggest also bagging thapsus and virgatum heads as you go. 05 Mar Warren Verbascum Kama, Central Plants sprayed with brush-off on 15 Feb are dead, but there are fresh ones along the sprayed track. Verbascum sprayed on 24 Feb in Central was just showing signs of death on 3 March, so time for brush-off to act is between 7 and 20 days. 05 Mar Gilbert Nodding thistles Central While many nodding heads have 'set' (about a third of the crop), many have not and bagging heads could be productive for another couple of weeks. 03 Mar Gilbert Nodding thistles While bagging seed heads and grubbing out stalks in Central I came across several seed head bearing thistles that had been slashed about 4 inches above ground and had re-grown and produced seed heads. Slashing alone therefore just delays seeding. Also observed that where big nodding thistles were slashed with flowering heads, the seeds did go through to maturity. The only benefit of slashing alone is therefore possible reduced seed dispersal. St Johns Wort Eastern, Southern Newly germinated plants suitable for spraying observed in sprayed areas. 01 Mar Bob Saffron thistles Dam, Southern I walked around the previously slashed areas in the dam and southern paddocks. Some regrowth but not extensive. Areas not slashed are horrific monocultures of seeded saffrons. Many Noddings in the bottom of the central paddock are dispersing seed, and there are also large numbers adjacent in the southern paddock. A large number of Noddings left from the CSO day and need bagging at the bottom of the "Nodding Valley" - the south east corner of the Weetangera paddock. 24 Feb Warren Briar rose Central As was found in Autumn, many of the briars have resprouted from old rootstock. This shows the importance of grubbing the main root and any laterals to effectively remove briars. 22 Feb Bob Saffron thistles Central Regrowth saffrons are starting to seed. Ones that were not slashed have seeded so further slashing should be confined to previously slashed areas. 20 Feb Pax Patersons curse Weetangera Patersons curse germinating around the mobile phone installation. General January ALG spraying around the mobile phone installation effective. There remains a need to walk all tracks treating and recording ALG presence. 19 Feb Pax Verbascum Eastern, Weetangera There are V. thapsus rosettes and early stalks in a patch on the NE corner of the eastern paddock, which are ripe for spraying or grubbing. While at it worth checking the thapsus patch on the SE end of Weetangera paddock. 16 Feb Pax Nodding thistles Central There are many rosettes to be sprayed to the west of the Valley track. 15 Feb Warren Saffrons Kama There is some regrowth and emergence of new plants in the earlier slashed parts of Kama. 15 Feb Warren Verbascum Kama There is a lot of V. thapsus emerging, particularly on disturbed ground, often associated with kangaroo camps. Density suggests spraying will be preferable to grubbing. 15 Feb Warren Nightshade Kama There are many small nightshade plants emerging scattered away from the "normal" areas where it is found (ie in disturbed areas under trees). Spraying now is likely to be productive. 14 Feb John F African love grass Forest Thanks for the item (12 Feb) - we do need to keep alert but probably not alarmed. Not to downplay the news, I'd like to report from Rosemary's walks through Forest block during 2010 that we have yanked out a couple of mature ALGs alongside paths that were well in from the edges. 13 Feb Pax African love grass Dam ALG heads were bagged today adjacent to the mobile phone tower .... needs to be sprayed now. I also noticed an ALG plant along the track separating Dam and Southern paddocks, bagged its heads, but needs spraying. Hawker There was another ALG clump on the "alternate" track separating the Forest and Hawker paddocks just south of the Marrakai entrance. Hawker On 10th Feb John noticed a lone ALG clump deep in the reserve on the track separating the Forest and Hawker paddocks, and nearly to Kama paddock. It has been dealt with. 10 Feb Warren Nightshade Hawker Lots of nightshade west of central track. Still more to spray down to the annex. 06 Feb John B Patersons curse Forest New Patersons Curse rosettes and flowering stems appearing beside the path down the western edge of the woodland and around the junction with the Macrorhyncha trail. 06 Feb John B Thistles Hawker Lots of thistle rosettes in that wooded area in the bottom of the Hawker paddock.